My Home and Garden: My first ever full grown carrots. Aren't these lovely carrots. The white ones sized up first. This white one is about 8 inches long. Can't wait to try them. I'm sure they will be delicious ... nothing tastes as good as homegrown. I bet they were very tasty! Home-grown carrots have so much more flavour than ones that have been sitting in a shop for days / weeks / months! You are right. There is nothing like homegrown. I spent my adult life hating fruit and veg. Then I had some REAL fruit and veg (farmer not supermarket) and realized I just hated supermarket produce. I grew up eating wonderful food right out of my grandparents garden....and you know the rest. Yes homemade tastes unbelievable. I have a story for you about home grown veggies. My boys grew up only eating home grown veggies that I froze for winter use. It was just what I did. Once we were eating a meal at a relatives house and they served frozen peas. Now my boys were "Hoovers" when it came to most any food. My oldest had a few peas and stopped and said "these aren't from your garden are they?" I never thought about these young boys being able to taste the difference until that time. Made me feel good! Oh! 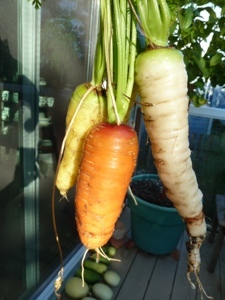 I just thought about a homegrown carrot story too! We had a dog named Coco when the kids were growing up. He liked veggies. He would eat peas in the pods if you split open the pod for him, carrots and kohlrabi. Only Coco and I ate the kohlrabi - I would cut him off a chunk and he would crunch it up. Anyway, My mom and dad were looking after him one weekend. My mom said she had some store bought carrots in the fridge and tried to feed one to Coco but he kept spitting it out. Later she was in the garden and found her carrots were ready so she picked some. She gave one to Coco and he gobbled it up! So even the dog could tell home grown! LOL! Joan thank you so much for the stories. I laughed out loud when you were saying that your son stopped eating the peas. My son to this day speaks his mind, he's 32 now, and I would have been 1) terrified about what was going to come out of his mouth. 2) having a serious case of anticipatory nausea!! I would absolutely trust my dogs opinion about food. I have cats....but you know what I mean.